I grew up by Rosebud beach, although I only occasionally swam in it. While I am a swimmer, it’s the deep blue clarity of a swimming pool around me, no waves and a clearly defined lap that I can repeat that draws me. Beach swimming is just not good training for me. But that’s not why I love going to the beach. Actually, that may well be exactly why I love going to the beach. For me, the beach is everything that work isn’t. It’s everything that an over-busy, normal, chaotic life isn’t. Even at the height of summer, when crowds struggle to find a little space on the sand to drop their towels, the beach and the soothing, silky water becomes a balm to whatever is making you itch, inside and out. 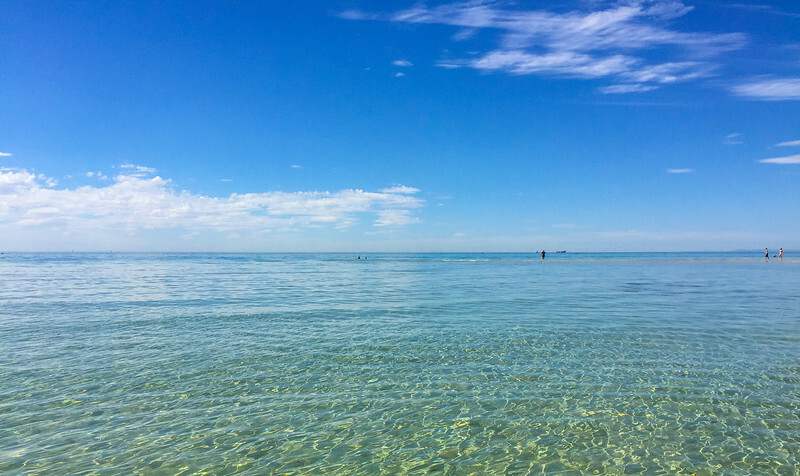 Melbourne and the Mornington Peninsula each stood in line a good half-dozen times each when it came to handing out superb beaches. We have Port Phillip Bay on one side and then Bass Strait on the other. This gives us easy access to both safe swimming beaches – some perfect for those with young children – on one side and pounding, spectacular surf on the other. Some of those ocean beaches also sport glorious cliffs where fossils are scattered about like buttercups in a spring field, or adventurous walks through layers of tea-tree and ancient rock formations. There’s an almost unending range of opportunities to explore all that’s best about Australia’s beaches – and all within an easy day’s outing. 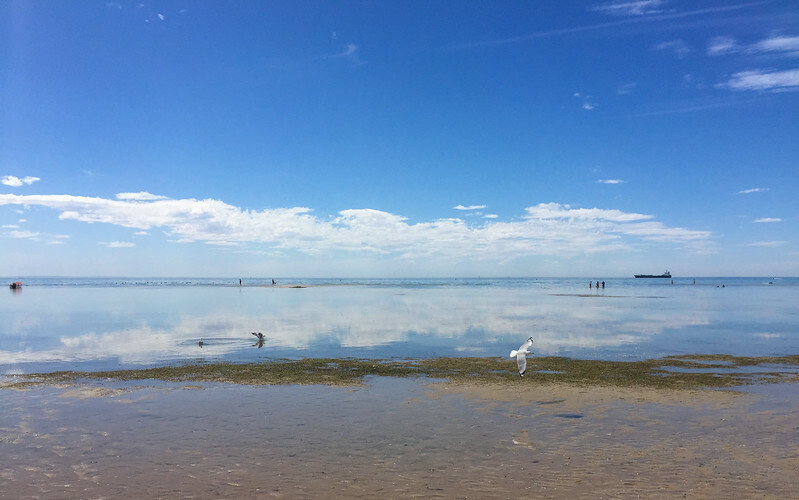 Some of these beaches I know very well, others I desperately want an excuse to explore – so I’ll be showcasing the best beaches of Melbourne and the Mornington Peninsula over the coming months. I’ll start off with my home town beach, Rosebud. 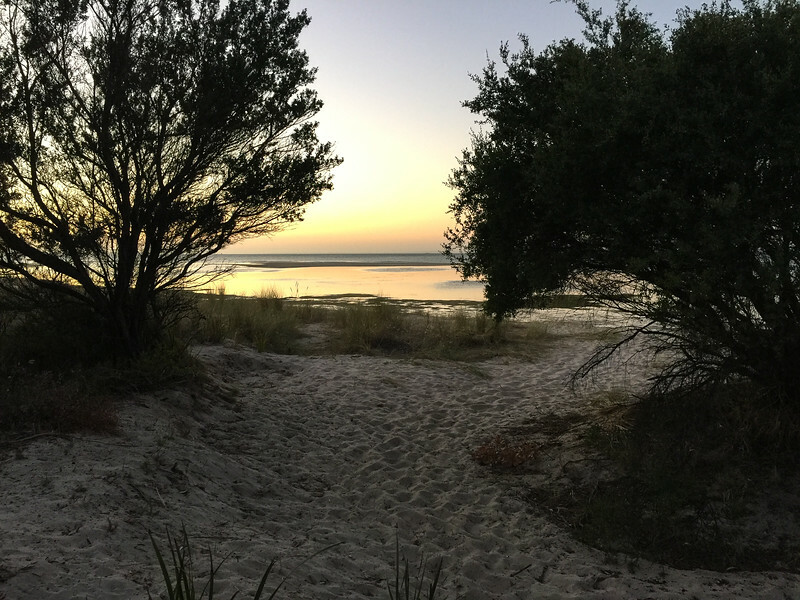 The Rosebud Foreshore is something of a legend as a holiday destination. 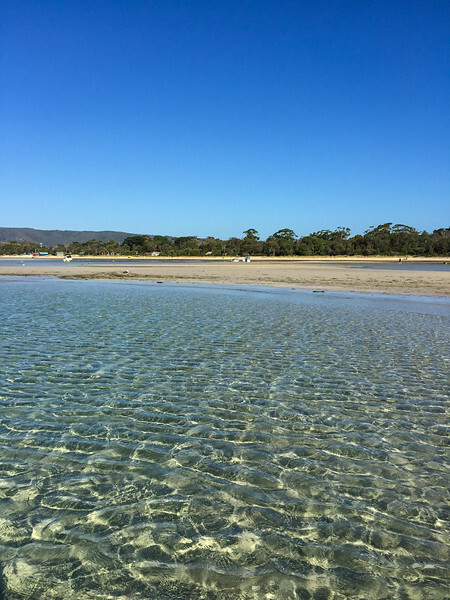 This strip of protected land between the highway and the water is a natural landscape of sand dunes and tea trees among which a sheltered camping ground has been created right next to the beach – but is still hidden from it. And there’s a reason this particular beach is so popular. It has plenty of sand for you to pitch your shade tent or throw down your towel, but then there’s this long shallow sweep before you get to deep water – even in high tide. 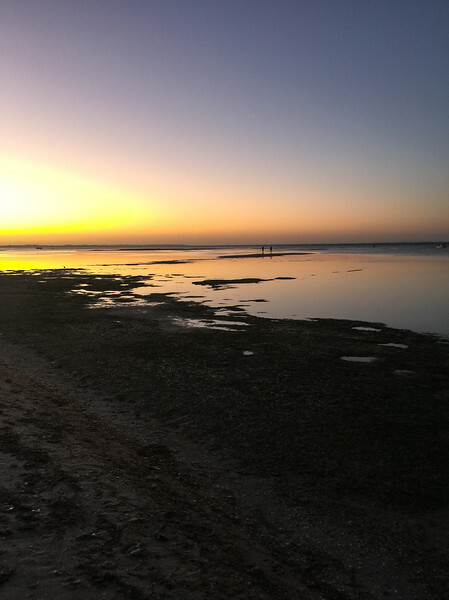 In low tide, you walk out through shin-deep water for a hundred meters before it begins to rise. It’s perfect for kids or adults who aren’t really swimmers, excellent for throwing games or beach floaties. And for people who are but just want to hang with their friends on a hot day. I can say from experience, that walking a few meters from your tent to sit on this beach with a cup of tea in your hands is one of the most civilized and peaceful ways of starting the day. Or sitting there as the sun sets, with a chilled wine to sip. Rosebud Beach has a rather roguish history. The area was originally called Banksia Point, a small fishing village in the mid 1800s. In 1855, a cargo ship called The Rosebud was pushed over the sand bars and wrecked on the beach. Swift and canny locals quickly relieved her of her cargo, and over the years, pulled apart the ship for building materials. The name Rosebud stuck. It wasn’t until the 1940s that camping on the Foreshore became common. By the 60s, the family tradition of spending the Christmas Holidays at Rosebud became legend. These days bookings for camping space over that period are taken a year in advance. You can find third and fourth generation families still coming back each year. 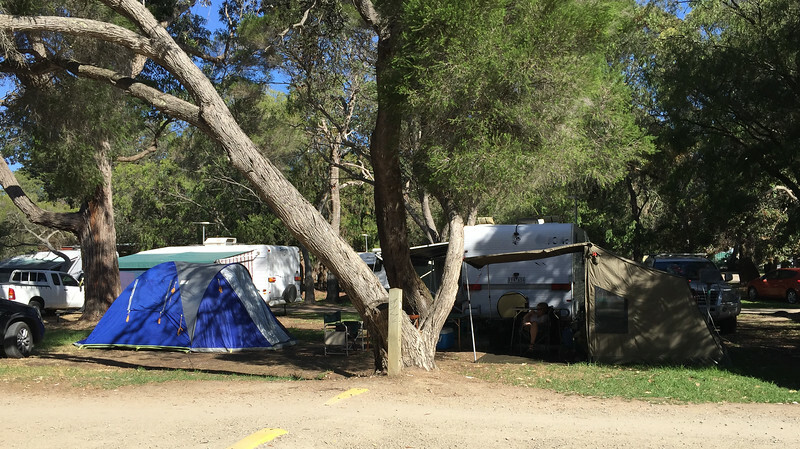 The camping area itself is sheltered by banksia, tea tree and sheoak, and the sandy ground makes pitching tents a breeze. Hot showers and toilet blocks are dotted along the way, while there are both powered and non-powered sites everywhere. If you don’t want to come in the frantic season – wait until after the school have gone back and suddenly the camp ground is peaceful and lightly populated again. The entire area is managed by the local Shire Council and you can either call or book a site online. Rosebud itself is just a drop in a gorgeous ocean of delights on the Mornington Peninsula, which makes it an awesome place to spend a weekend. But whether you go for a day or a week, make sure you spend some time at the beach. You’ll just love it. What’s your favourite beach? If it’s anywhere near Melbourne or the Mornington Peninsula, let me know and I’ll go and explore!